The Italian Serie A side of Cagliari Calcio are unique in how they manage to stay in the top flight of Italian football with only a small base of fans to draw from, along with limited funds to compete with the likes of AC Milan, Juventus, Napoli and Roma. In fact every season is a roller-coaster ride for the Rossoblu fans not knowing if it will be another fight to avoid relegation or the possibility of playing in European cup competitions. This season (2011/12) it looks like the Sardinians will not have to worry about either two scenarios occurring as they languish mid-table in 13th place. The team was formed in the in the city of Cagliari the largest city on the island of Sardinia with a population of 150,000. Cagliari Calcio plays their home games in the Stadio Sant’Elia via Vespucci 09126 Cagliari which is located in the southeast of the city right on the Mediterranean. Built in 1920 the stadium has a capacity of 23,486 seats, which seems massive if compared to Serie A rivals A.C. Siena who have a capacity for just over 15,000. Cagliari also had a brief spell flirting with a newly formed league in the United States called The United States Soccer Association, where along with other teams imported from Europe such as Sunderland, and Dundee United, Cagliari played for one season as the Chicago Mustangs before the league was disbanded. 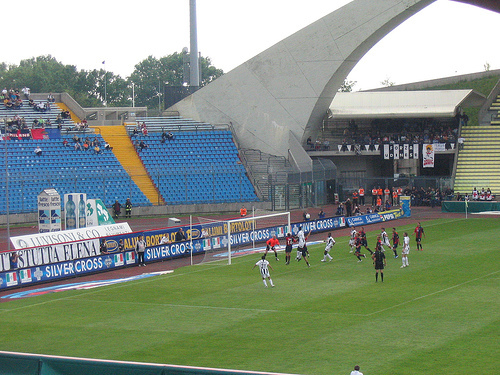 Action from a Serie A match between Cagliari and Chievo, 2010/2011 season. The Golden Year for Cagliari was 1970 when the team won the Italian Championship that season, with the team only losing two games, and conceding just eleven goals. (The fewest in any major European football league to this day). Cagliari were Inspired when Angelo Domenghini joined the side. He played along with striker Luigi Riva, who would later play for Italy in the 1970 World Cup final with the Italians losing 4 – 1 to Pelé and his Brazilian teammates. Of all the Cagliari players it is Luigi Riva or “Gigi” as he was most often called making his debut for Cagliari in 1963 in Serie B while improving with each passing season Gigi’s left foot was becoming a weapon that frightened the big boys of Italian football. The planets all seemed to be in line for Riva starting to become not only one of the best strikers in Italy but also in the world with the signing of fellow International Angelo Domenghini, Cagliari dominated Serie A and romped away with the title. Riva was a man of conviction turning down all offers from other clubs to stay in Sardinia and play for the I isolani (islanders). Finally after two broken legs and numerous other injuries Riva was forced to retire in 1978 taking a back office job with Cagliari, and helping the Italian national team to World Cup victory in 2006. Cagliari retired Riva’s number eleven jersey in 2005 in honor to him and his services for the club and is the only club jersey to be retired to date. So for an unusual football weekend away why not fly to Cagliari and watch a match. Book a Sardinian apartment and relax along the five-mile-long Poetto Beach? Enjoy some fresh Italian seafood while sipping on a glass of chilled Vermentino di Gallura white wine. Low cost flights are available from the U.K. on Easyjet from Stansted for £110 round trip. Tickets for matches are available online from 60€. Hotel and Apartment rental costs vary but good bargains can be found, especially when accommodation is booked well in advance. This article was authored by Nathan Griffiths on behalf of Car rentals Europe specialist e-rentals, use their comparison service the next time you need to hire a car. This entry was posted in Soccer and tagged 1970 World Cup final, 2006 World Cup, A.C. Siena, AC Milan, Angelo Domenghini, Cagliari Calcio, Chicago Mustangs, Dundee United, European cup, european cup competitions, Gigi, island of sardinia, Italian Serie A, Juventus, Luigi Riva, Napoli, Pele, Roma, Rossoblu, Soccer, sports, Sunderland. Bookmark the permalink.